Creative team building at its best! 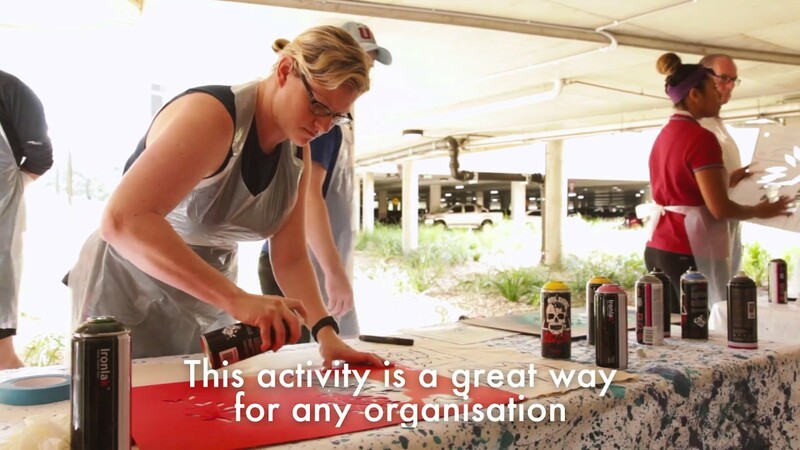 Working with our local team of artists, you will create lasting artworks based on your company values or messages. Firstly you’ll be guided through a skills session where you will practice certain techniques. From here, you will brainstorm and create a design with the help of our talented team. Once the outline is ready, the real fun begins! Our challenges are far more fun than basic scavenger hunt tasks. You’ll receive missions where everyone gets a hero moment. Our process is perfect for weaving in your company values and mission into living, breathing values. We’ve proven anyone can do it. A shared new experience gets everyone talking, collaborating and sharing. You’ll meet some of the best in the business, learn techniques and patterns to guide your artworks. First time holding an aerosol can? No worries. Not saying you’ll be an expert but after some pointers you won’t want to put the paint down! We don’t trust you with the aerosols right away! Before we get started, we’ll set the scene with a creative icebreaker, before delving into our creative process. This brings the best out of the group through a few simple steps. This creative activity can be designed to suit groups form 5 to 150 people. Depending on your group and objectives, we may recommend creating individual artworks, or working in small teams. There is also an option to create artworks which are then auctioned to raise money for a chosen charity.